A while back I decided, for no good reason, to create a comic about... something. I've never made a comic, but hey, how hard could it be? I mean, look at Ziggy right? I don't mean to slag Ziggy, but he kind of asks for it. Anyway, since I had a lot of experience reading really good comics like The Far Side and Calvin & Hobbes and Garfield(remember Nermal? Now that was some cute), I felt I was qualified to give it a go myself. Why this mindset is acceptable for comics and not, say, building my own car from scratch(because hey, I've driven those things for years), I don't know. So it turns out that it is easier to make a comic if you actually have a character to work with. Staring at some neat squares you made on a piece of paper doesn't exactly make the images flow. Once you have decided on a character and what it might look like(An Orca! That lives in town! He walks on his tail flukes! ), then you draw a profile and a face front picture of them so that you can maintain some sort of continuity throughout your comic. I didn't want my whale to be 5 ft tall and chubby in one frame, then 15 ft tall and slender in another. Though that would be kind of cool. Hmm. 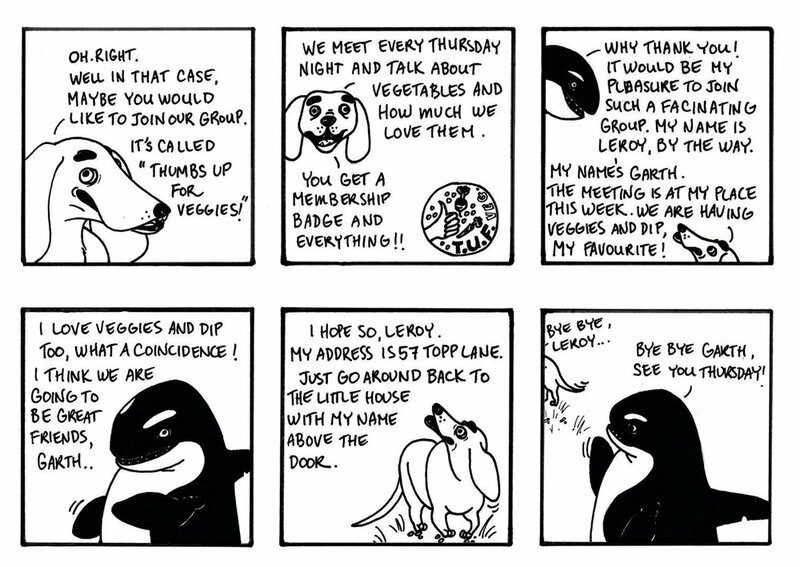 Long story short I made a little comic about an orca named Leroy, who, because he is a kindhearted and thoughtful member of society, was canvassing for the whales. And after I made that little ten frame comic, I didn't make another one for ages. This tells me that I am perhaps not meant for the cutthroat world of a cartoonist, where the ideas need to flow much faster than one every 6 months. But I did make another one, and that is the one you will see below. We get to find out an unusual proclivity of Leroy's, something a little out of the ordinary for an Orca. And he finds a friend, which is great, because Leroy is such a nice fellow. Now I have... two comics! I am on fire.